Three Floyds’ extravagant beers make it the topic of frequent conversation in these pages. Sadly, its distribution map, which consists of a few patches of enlightenment among vast expanses of medieval darkness, makes its beers a seldom subject of our tasting notes. But that’s why God put Cincinnati on the border of two other states, Indiana and Kentucky–so we Ohioans could make 21st century rum runs across the border and bring back a bounty of Three Floyds. I picked the Black Sun simply because even in the enlightened* Commonwealth of Kentucky, there were not a lot of choices from Three Floyds. There were only five styles and I bought four. I brought back 2 bombers each of Black Sun and Dreadnaught IPA, and 2 six-packs of the Robert the Bruce Scottish Ale… I short-sightedly, though generously, left the Panzer Wolf IPA with friends in Kentucky. The only Three Floyds beer they sold that I didn’t buy was the Gorch Fock German-Style Lager. I could not wait to start cracking these brews. First one up: Black Sun. Herr Direktor was the lucky guy who got to share the bomber with me, back at his place with Frau Direktor looking on bemusedly. 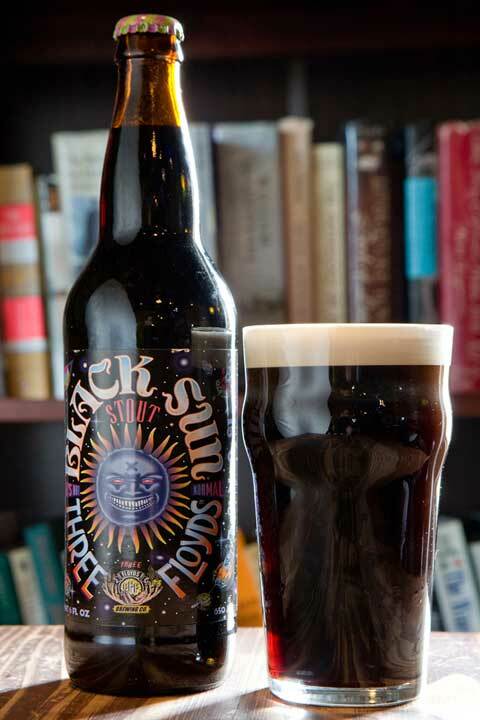 Black Sun is a Dry Irish Stout, though it is thicker — and at 6.5% ABV, slightly more alcoholic — than others of the style I have had. The bomber poured as dark as brown can be without being black, with a pillowy, brown head that would have outlived the beer if each sip weren’t so precious that I spent 45 minutes drinking it. Nice tentacles of lacing the color of toasted marshmallows decorated the glass. If you closed your eyes and smelled you would never guess this was a stout. It smells like a double IPA: very hoppy with aromas of coffee, caramel, citrus and pine. It didn’t taste like an IPA, of course, but the hop presence was apparent from the astringent finish. The taste itself is complex. There are more flavors in it than I can count. The most obvious is a chocolate roasted malt taste. There is also citrus and a dried fruit flavor — Frau Direktor identified it for us as black currants — as well as a hint of pine. It is a malt bomb at its core, but it also has a strong smoky flavor–and then there is the finish. The Black Sun is very smooth and silky… almost too silky for a dry stout. It is creamier than others of its style. It is robust across the board: smell, taste, mouthfeel. It is too rich to be really drinkable, but I would have cracked open the other bomber instantly had it not been in such short supply. I’m declaring this the best dry irish stout in America. Nevermind that I’ve only had about 10 of them. (Of those I have had, North Coast Old #38 is a distant second, and I’d put Russian River’s O.V.L. and Moylan’s Dragoon behind that.) If you know of a better one, put it in the comments and I’ll get my hands on it to do a comparison. If you want to broaden the net a little and include beers that are similar if not technically in the same category, I would put it head to head with the Bell’s Expedition Stout (a high compliment) or the Guinness Foreign Extra Stout. ﻿Before my fellow aleheads pester me to return to Kentucky and send back beers, I’ll refer you to the package store where I got them, since you can buy these suckers online: http://www.thepartysource.com/. Just tell ’em the Commander sent you. Posted in Tasting Notes.Tagged 4 Hops, beer run, Beers of the Midwest, black sun, dry irish stout, indiana, irish stout, Stout, Three Floyds. Can you drive to Kentucky and send me some? This sounds amazing. Great stuff, Commander. Black Sun is an outstanding offering from what, for my money, is easily the best brewery in the United States. I cannot… repeat cannot believe you gave up a bottle of Panzer Wolf.